I’m behind on all my favorite blogs, so I missed this post from Mighty Girl. Since Seattle is just starting to enjoy summer this is actually perfect timing. I’ll bet this would work well with Apriums, small plums, or large strawberries. I’ll try and report back next week. 1. Test your apricots to make sure they’ll stand up on their bums. 2. While your apricot is standing on a flat surface, take a metal cap (I used one from a booze bottle), and press it into the stem end. 3. Use a knife or small spoon to pull out the top and the pit beneath. When my toddler helps empty the recycling and holds up a bottle saying “Mama beer?” I feel a motherly pang. However, when I search my conscience I realize that I’d rather my child find beer bottles than pop cans. She sees the adults around her cook and eat healthy foods and enjoy snacks in moderation. She watches us drink water and coffee and beer/wine (and occasionally cocktails, which is her only reference point for juice). We’re healthy, loving, responsible grownups who actively engage with smart, physically active kids. Even digging deep into my mom psyche, I can’t feel guilty about alcohol being part of our lifestyle. I didn’t drink while I was pregnant. I intended to, but as it happened I had a huge aversion to alcohol–that’s actually how I realized I was pregnant. My pregnancy nausea was moderate but persistent and pretty much everything except really spicy teriyaki set me off for a very long time. After the nausea was (mostly) resolved, even smelling alcohol made me queasy. I was disappointed that I didn’t get to enjoy a glass of wine with my sweetie and a little relieved I didn’t have to deal with people giving me dirty looks while I drank it. Both scientific evidence and several thousands of generations of humans (including our own) show that it’s safe for the average pregnant woman to consume some amount of alcohol without causing serious harm to her fetus. There are always exceptions and I’m not here to debate the issue–though you’re free to do so. The science on drinking while nursing is much more clear and the evidence is overwhelming that moderate alcohol consumption does not harm a breastfed infant.. Alcohol content in breast milk is the same as alcohol blood volume (ABV). Even if your ABV is high enough to impair your ability to drive a car, your breastmilk will not significantly harm your baby. Alcohol inhibits production and some studies show that babies will refuse the breast if significant amounts of alcohol are present in the milk. If you’re pumping and storing milk, there’s a chance you’ll expose the baby to more total alcohol than if you’re nursing directly. There is no need to or benefit from pumping milk & disposing of it. “Pump & dump” does not clear your system of alcohol. Here’s the bigger picture: if you’re drunk enough that you’re seriously worried about alcohol content of your milk, you’re probably too drunk to safely & responsibly parent. Forget about nursing–you probably shouldn’t be holding an infant or caring for a young child alone. If you’re concerned about your alcohol consumption (amount and/or frequency) talk to your health care provider–not your pediatrician. The Prime Minister of England forgot his kid in a pub. It’s international news. Because the location happened to be a pub instead of a tea shop, tongues are wagging doubletime. I highly doubt this incident had anything to do with alcohol consumption–both parents were probably sober enough.When you think about it, it’s surprising this doesn’t happen more often. 3 kids in 2 cars with lots of extra adults milling about is a setup for forgetting someone. Let’s focus on how Cameron’s policies affect all kids in England, not on how his 8 year old daughter spent 15 minutes waiting for her parents to collect her from a pub. People often forget that much of Seattle Center is public space. There are some fantastic activities within the Center grounds that require a fee for entry, but there are also tons of ways to enjoy yourself for free. There are also two businesses as of June 2012 that sell beer–Pie and the burger joint. Many events feature beer gardens, which will not allow your kid but can be navigated if you plan your visit with extra adults. Lots of potential happiness! We almost always take the Monorail, because it’s cool. It’s cash only, so be prepared. Get a round trip ticket only if you can remember where you left your ticket stub… Kids under 4 are free. These are 50 ideas I came up with off the top of my head/with a little digging on the Seattle Center website. What will your next 50 visits to Seattle Center be like? Attend a Concert at the Mural–FREE live music brought to you by KEXP! high chair happy hour, a photo by melissajonas on Flickr. 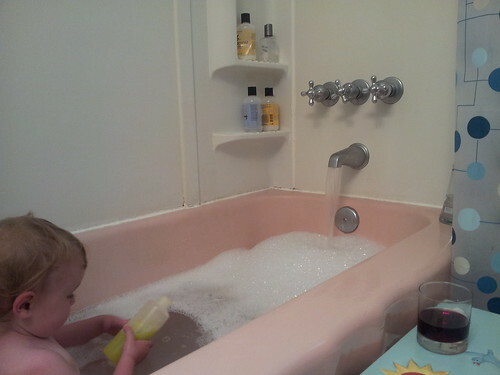 Sometimes High Chair Happy Hour is sitting by the tub with a glass of wine while the 2 year old plays. Untitled, a photo by melissajonas on Flickr. I’m not generally a competitive parent, but I’ll admit I’m pretty darn proud of my ability to carry a small bag with great toys. parent essentials: wallet, keys, phone. I wear these in a small string bag that never leaves my body. If you haven’t spent much time around kids, you might not realize that the toys & books are probably the most important thing on this list. Pull out toys when you’re on the train, waiting for your order, or waiting for the check. I rely heavily on environmental distractions (dogs in the lobby, bus out the window, etc) but good purse toys are key. You need something portable and fun, but not precious enough that if it gets lost or dropped on a public bathroom floor the kid will freak out. Some of our favorites have been: finger puppets, plastic eggs with surprises inside, a mini slinky, stickers, small cars, small dolls, etc. She loves the tiny clay I packed, but I’m reluctant to pull it out unless we’re going to be somewhere for a long time. It can be messy and it’s oil based, so we need to at least wipe hands if we’re going to eat. Sometimes I bring a couple of crayons, often I just let her scribble with the pen I keep in my purse. I sometimes carry small board books. This Richard Scarry is one of our mutual favorites–it’s a great size and has a lot going on. I try to avoid relying on gadgets, but a few good apps on your phone can keep an older toddler or preschooler happy. We like simple puzzles and have found some good coloring and bubble apps. Snacks are also key to keeping your monkey happy. Pack portable, interesting snacks like: cucumbers with salt (vinegar if you really trust your container), carrot sticks, hummus, raisins, apple slices, olives, cheese & turkey cubes, etc. I found some great reusable cloth bags that help cut down our plastic consumption a lot. We’ve never been big on sippy cups, but I shared my travel mug with the kid until we finally lost it. I generally only bring her water bottle when we’re using the stroller or driving–it’s heavy and we’d both be sad when it got lost. 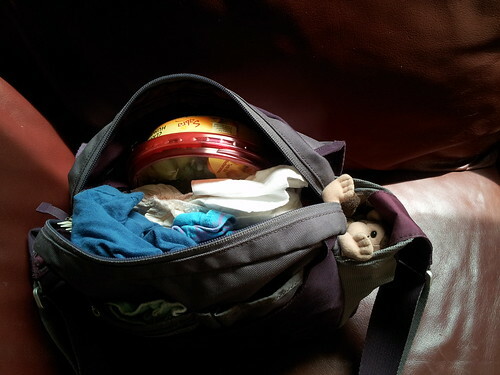 Try to pack things your kid will eat this trip. No one wants week old raisins or the same stale pretzels. If you pack food you (the parent) will eat, it won’t go bad. Pack as little as you need in the smallest bag you can find. Bonus points if you bring a string bag inside your regular bag for shopping trips, etc. Not only is this environmentally responsible, it means you’re less likely to leave purchases somewhere–you’ll notice that string bag on the playground, but you might walk away from a plastic bag. Remember to check your bag when you get home from an outing. Toss or launder anything you used and replace as needed. If you haven’t used any clothes lately, make sure they still fit and are the correct season. Don’t be afraid to borrow or buy something you forgot. If you live in a city, you’re probably never far from somewhere that will sell you wipes or snacks. When out with friends, pay it forward by offering a diaper–you’ll need one someday. You can also improvise–paper towels doused in the sink work well if you forgot wipes, for example. When all else fails, head home. I pack light so I can chase my toddler without abandoning my stuff. I like to be able to take the escalator or stairs instead of waiting for the elevator. Mostly, I prefer to know where everything is at all times–including the kid. If I’m rummaging through 3 pairs of pants to find the raisins I’m positive I threw in the diaper bag, I may not notice when my daughter hides under the table at the library. I may not get benefits or L&I protection, but at least OSHA can’t keep me from drinking at my job site-. Unlike these guys, who are are going to have a rough time. Sounds like they’ll at least remain employed. I’m only slightly concerned their alcohol consumption may create a safety hazard, though it sounds like they’re not the most discreet consumers of alcohol on the market. They might be less than responsible in other aspects of their job. Who knows? It’s not as interesting a story to investigate if they’re actually doing a good job and may have been celebrating at work. Maybe there’s real news here, maybe it’s just a chance for reporters to collect comments on a story. Let’s all hope that the 520 bridge will be okay. I often joke that beer makes us better parents, and I believe this can be true. Moderate alcohol consumption is a part of our culture, and social drinking is an opportunity to relax and connect. Booze can help us unwind and give us a little perspective on how important the kid’s undesirable behavior really is. It tastes good. I like it. All jokes aside, drink responsibly. Model the kind of behavior you hope to see when your kid (almost inevitably) explores alcohol. Buy good beer. Recycle your bottles & cans. Don’t drive or parent drunk. Engage your friends if you’re concerned about their habits–ask directly how they are and tell them if you think you see a problem. Be responsive and thoughtful if someone engages you. If it’s a matter of a teetotaler judging your beer-a-night habit, feel free to let them know you appreciate their concern but you respectfully disagree. (Or tell them to go to hell–your call.) If it’s a matter of a close friend sharing their concern that you always have a drink in your hand…well, pay attention. Alcohol addiction and outright inebriation are unsafe and unhealthy for the individual, their family and friends, and the greater community. Please, drink responsibly. Be happy, not stupid.